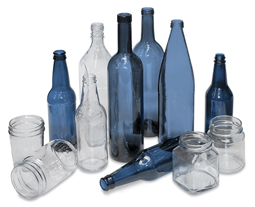 SANDY, UT — The city is now accepting glass bottles and jars for recycling. Items can be dropped off at Sandy City Public Works, 8775 S. 700 West. This service is available Monday through Friday from 7 a.m. to 4:30 p.m. 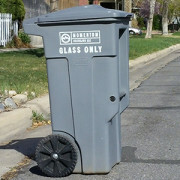 The glass will be taken to a local glass recycler, currently Momentum Recycling, which operates in the Salt Lake Valley. The recycling program is a partnership between the city and Waste Management of Utah Inc.
SALT LAKE CITY — Curbside glass recycling programs are ready to begin in select Salt lake City neighborhoods. City workers began delivering glass recycling bins Oct. 17 to residents in neighborhoods between State Street and 2000 East, including the Avenues and Capitol Hill. Collection will begin Nov. 1 and will take place once a month. Salt Lake City residents will now find it easier to recycle their glass waste thanks to a new curbside glass recycling program that begins next month. The program will at first only serve residents who live between State Street and 2100 east. Bins will be delivered in the next couple of weeks before the first scheduled collection on November 1. Next spring, it will expand to anyone who lives in Salt Lake City. SALT LAKE CITY–(BUSINESS WIRE)–Momentum Recycling, a local family-owned recycling services and processing company, has selected the nonprofit group Odyssey House to help staff Momentum’s new glass recycling facility. The facility, located near Salt Lake International Airport, represents a major expansion for Momentum. Built using the latest glass recycling equipment, Momentum’s new facility will recycle waste glass from along the Wasatch Front and beyond for reuse as raw material by local and regional manufacturers. You can help keep glass out of the landfill. Start recycling today.